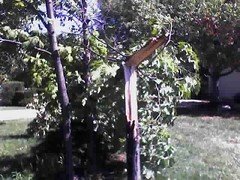 Well, now that we have power again (after being down about 17 or 18 hours), I can post a bit about yesterday's storm. We were having a late lunch at Moose Head, out on their new patio, as the clouds rolled in and the distant thunder rumbled ever closer. We managed to finish our meals and head out before it hit--but we escaped being completely soaked by only about ninety seconds or so; by the time we'd gotten to the intersection of Detroit and Dover Center, the rain was coming down pretty hard. Once safely home, we watched a bit of TV, occasionally pausing to marvel at the torrential downpour outside and thanking our lucky stars that the roof replacement had already been completed. The weather got increasingly wicked, and we watched our trees thrashing feverishly in the wind amid sheets of thick, grey rain. I heard a noise from the living room that sounded like the cats getting into trouble, but nothing seemed immediately amiss. 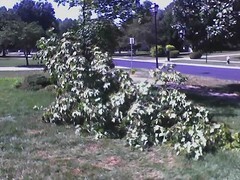 That's when I saw that one of the trees in the front yard had snapped in half. Gradually, the storm faded and the rain let up. Oddly, it wasn't until the sun came out that the power went. I won my bet with Liz -- I had a feeling it was going to be out all night. 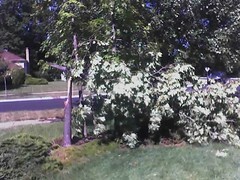 Now that things are starting to get back to normal, it's time to borrow a chainsaw from one of the neighbors and take care of the broken tree. On the plus side, the storm damage gives me an excuse to test out the camera on my new phone; it's not the greatest, but I have to confess that it is terribly convenient. Music: Lamb - "Hearts And Flowers"